“PF” type glands, certified Increased Safety Ex eb are suitable for use in Zone 1, Zone 2, Zone 21, Zone 22 and in Gas Group IIC. They are manufactured from polyamide and provide a controlled pull resistant displacement seal on the cable outer sheath providing both Ex eb & IP protection. 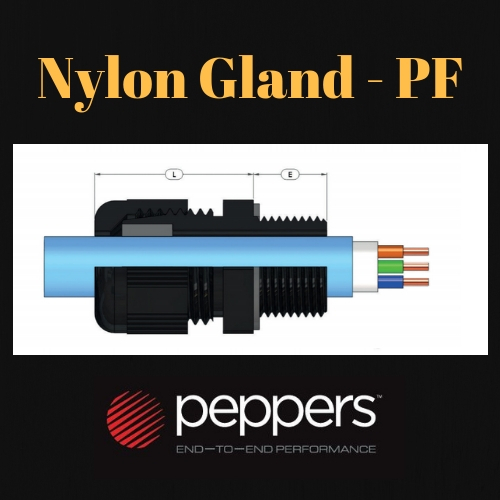 The gland has been tested to IP66 & IP68 to 50 meters and is fully compliant with the Increased Safety standard with no reduced impact restriction. Available in black or blue, in a range of thread forms complete with an IP flat washer onmmetric entry threads. Assembly instructions must be read prior to installation and adhered to in full. • If used in a threaded entry, NPT versions may protrude more than “L” length due to engagement of threads. • Industrial Non-Ex versions are not supplied with IP thread sealing washer.